"Cookies arrived and EVERYONE is thrilled... all said YUMMY and really, really good. Thank you! Your cookies and service made me thanking them sooooo simple and easy. YOU and your team ROCK! - Cathy"
"I just wanted to say thank-you for delivering those awesome cookies to my husband yesterday. It made his week and increased his office popularity, which is a good thing, because he works in IT and has to deal with grumpy people all day. Thanks again and have a lovely day! Sincerely, Avril"
"Your products are delicious and I'm so glad you offer this delivery service! - Michelle"
FRESH BAKED COOKIES are waiting for you . . . Welcome to COOKIES OF COURSE - how may we serve you? 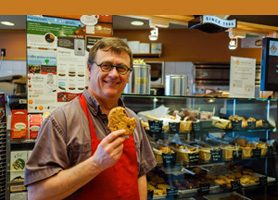 Cookies of Course - Treating our customers well since 1984! © 2019 Boysen Food Sales Ltd. All rights reserved.